The gifts of the Spirit are ministry gifts. The condition for receiving them is that a person must be born again and baptized in the Holy Spirit. No one can have any of the gifts without the giver, who is the Holy Spirit. While most people quote First Corinthians when listing the gifts, there are actually two lists, the other being found in the book of Romans. Romans 12:6—8 says, "We have different gifts, according to the grace given us. If a man's gift is prophesying, let him use it in proportion to his faith. If it is serving, let him serve; if it is teaching, let him teach; if it is encouraging, let him encourage; it is contributing to the needs Of others, let him give generously if it is leadership, let him govern diligently; if it is showing mercy let him do it cheerfully." 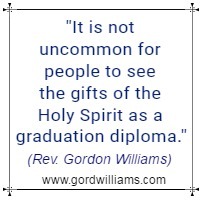 "It is not uncommon for people to see the gifts of the Holy Spirit as a graduation diploma." They wait to manifest one or more of the gifts before they will believe that they have been accepted by God. Others feel that manifestation of the gifts will bring them some sort of spiritual status among believers. In actual fact, the gifts of the Holy Spirit have little to do with the person who manifests them. The actual recipients of the gifts are those to whom God ministers via the manifestation. For example, when a word of wisdom is spoken, the person speaking the word is simply the instrument God uses. The actual recipient of His ministry gift is the person to Whom the word is spoken. Thus, the gifts of the Spirit are given to us so that we can minister to the needs of other people. The gifts of the Spirit are usually called "charismatic gifts" because they come from a Greek word (charismata) that means "gifts of grace" or "grace gifts,” which are used for ministry. Apostle Paul wrote, “All these [gifts] are inspired by one of the same Spirit who apportions to each one individually as he wills" (1 Corinthians 12:11). The King James Version uses the phrase "dividing to every man severally as he wills." The word severally means "individually, separately," in the dictionary. 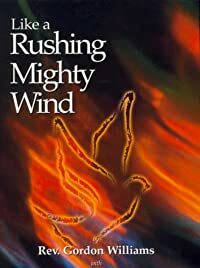 Although it is true that all gifts are resident in the Holy Spirit who indwells a Spirit-filled person, it is His choice which gift or gifts of the Holy Spirit we are actually allowed to participate in the ministry of Jesus. We become a part of the signs and wonders that he continues to work in and through his body, which is called the church.